Nevada Route 267 offers still another interesting route into Death Valley National Park from the east. Turn west onto Route 267 from U.S. 95 at Scotty's Junction, Nevada, 68 miles north of Furnace Creek Visitor. 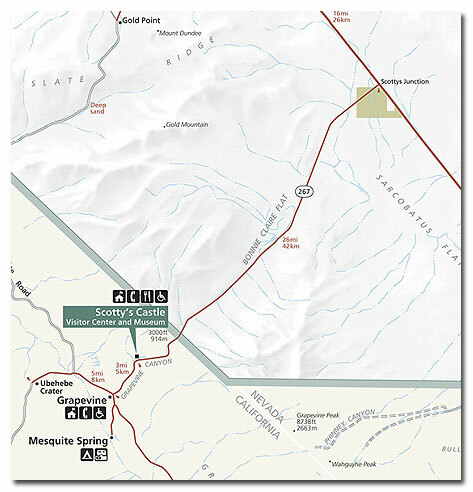 This route passes through Grapevine Canyon at the Park's north end and runs by Scotty's Castle (3000 feet), nestled among Cottonwood trees at the 26 mile mark near the canyon's mouth. Construction on this out-of-place-looking, Provincial Spanish "castle" began in 1922. It was designed as a vacation retreat for wealthy midwestern insurance executive Albert M. Johnson. Walter E. Scott, better known as "Death Valley Scotty," was Johnson's friend and frequent guest. 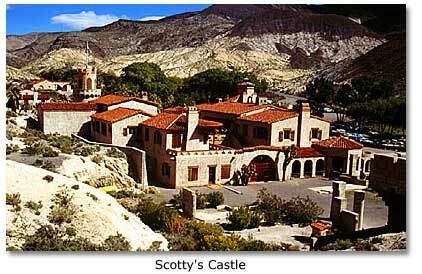 To Mr. and Mrs. Johnson the place was Death Valley Ranch, but to everyone else it has always been "Scotty's Castle." After Johnson's death in 1948, Scotty resided at the ranch for the six remaining years of his life. In 1970, the U.S. Government purchased the ranch and made it part of Death Valley National Monument. About 8 miles past Scotty's Castle, turn right to visit Ubehebe Crater (5.5 miles). 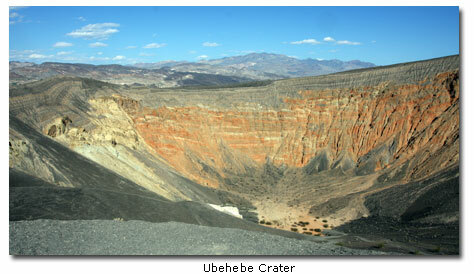 Ubehebe is the youngest volcano in Death Valley, caused by an eruption of steam about 1,000 years ago. The crater is 2400 feet in diameter and 750 feet deep. Oxidizing ores provide a colorful contrast to the dark volcanic ash surrounding the crater. From here, heading south toward the Visitor Center, the road passes Grapevine, then the turnoff to Mesquite Spring Campground with its amphitheater. It is another 30 miles south to the spur road of Historic Stovepipe Well, a rusted, hand-operated pump surrounded by stovepipes marking the location of an historic water hole. The Sand Dunes are also accessible from the picnic area near here. The highway south joins Route 190 here, and 5 miles further is the spur road to Salt Creek Interpretive Trail. The creek is all that remains of a large freshwater lake that existed 2000 years ago. Pupfish, which have adapted to the extreme heat and salinity, as well as birds and other wildlife, can be seen in the spring from the boardwalk which parallels Salt Creek. Ballarat, California.At the end of every rainbow is a pot of gold. Parked at the base of the Panamint Mountains are the remains of Ballarat, California. Founded in 1876 as a supply center for gold mines and prospectors, Ballarat lasted 21 years. 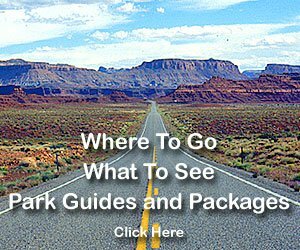 Take the Death Valley grand tour - see the Badwater Basin, the lowest place in North America; the dramatically eroded Sabriski Point; Artist’s Palette, with its unusual tonal colors; Salt Creek and its pupfish, Titus Canyon and more! 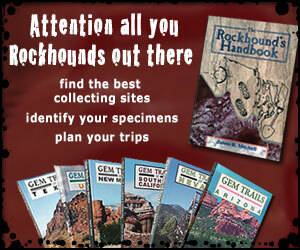 See why Death Valley is such a spectacular National Park!